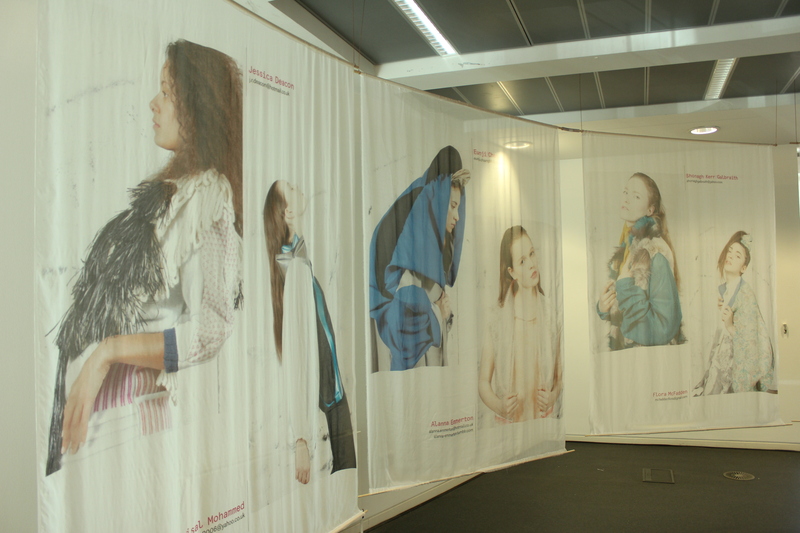 One of the highlights of the Edinburgh creative calendar for me is the ECA Degree Show. For nine days each June, Edinburgh College of Art is transformed into the the capital’s biggest and most diverse gallery space. The 2013 exhibition features more than 500 graduating artists, designers, architects and film makers, and this year’s offerings included oversized kitchen utensils, floating jellyfish and jewellery beards (more on that soon). 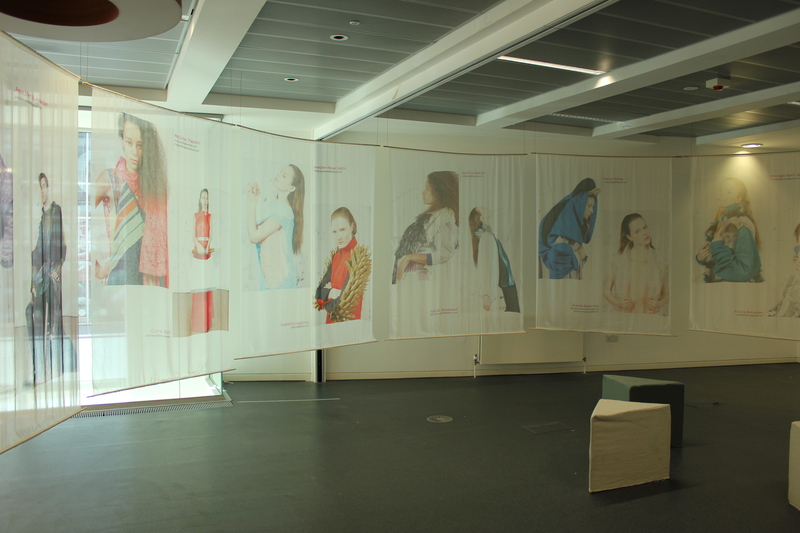 I’m always especially keen to see the work of the final year fashion students. 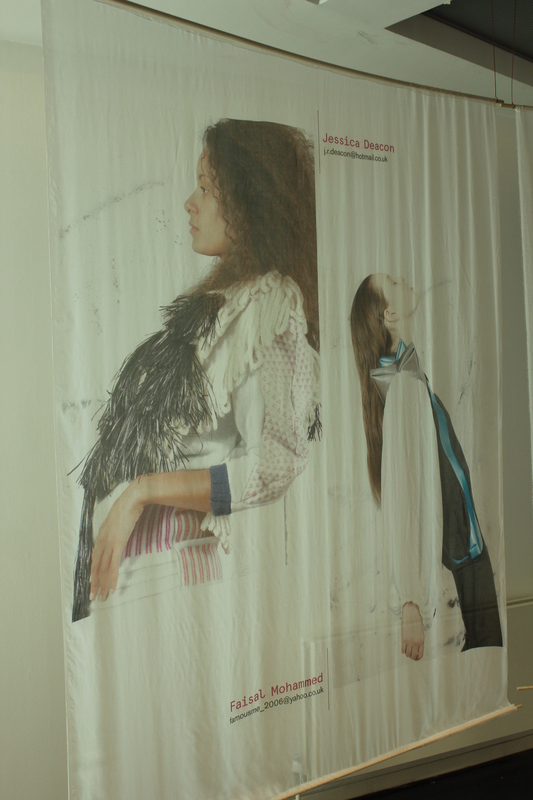 The ECA’s Fashion Programme is renowned for its multi-disciplinary approach to design, and its graduates can be found at fashion labels around the world. Edinburgh has its finger firmly on the fashion pulse, with recent high profile collaborations including those with Michael Kors and Sophie Hallette. The ECA’s commitment to diversity is admirable; Edinburgh helped pioneer the ECA and All Walks Beyond the Catwalk Diversity Network and collaborations with History of Art and the Scottish National Portrait Gallery, ‘Fashioning the Renaissance’, highlight the emphasis given to academic research into designing for consumer diversity. This year the ECA Degree Show coincided with Graduate Fashion Week, so sadly I’m not able to share any close-ups of the clothes with you, but I thought I’d share a bit about the graduating students and their final collections anyway – and you can also see their work on Vogue.com UK here. Jennifer Alexander’s AW14-15 collection, ‘Don’t Shoot the Advertiser’, examines the information overload of contemporary life and the way it affects us subconsciously, including our ability to distinguish fantasy from reality. Her work takes inspiration from Nineties children’s television with a clashing colour palette and chaotic textures – a true homage to the decade of her youth (and mine) and its tacky television culture. It’s not all playful though; her patterned knitwear has a distinctly grungy edge that hints at a darker message. Andrew Alastair McLaren’s menswear designs are a triumph of layering – which he makes look effortlessly wearable. In his AW14-15 collection ‘Glitch’, he has developed a distinctive modern aesthetic with artful tying, twisting, cut-outs and fusion of fabrics – which he describes as a sartorial ‘Hide & Seek’, concealing the traditional heart of his work. McLaren won the Johnstons of Elgin ‘Excellence in Tailoring’ Award in 2012. Alanna Emmerton’s AW14-15 collection is entitled ‘The Attachment Theory’. 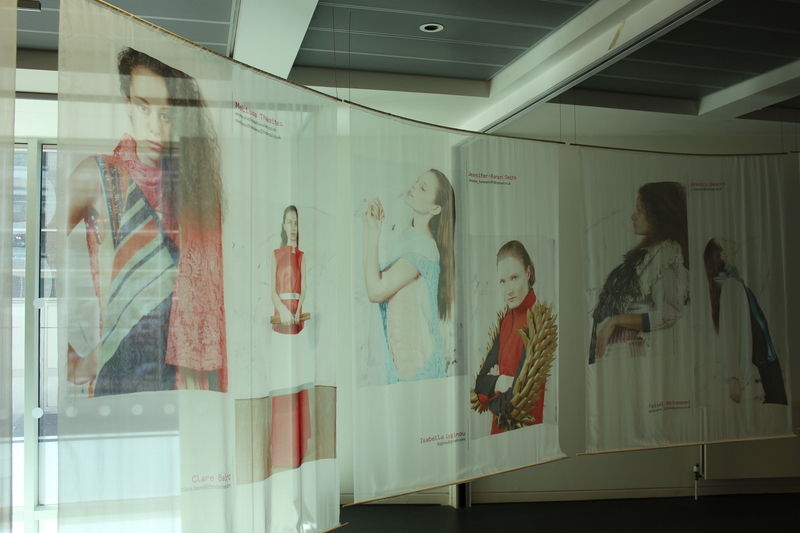 This concept is something that fascinates her, and her designs explore the idea of connection and disconnection through complex manipulation of fabric and different ways of binding. Her designs are complex and delicate yet have a strength and boldness about them. “‘Attachment’ is a deep and enduring emotional bond that connects one person to another across time and space,” explains Emmerton, and her clothes touch the heart of this emotion. Heather Archibald’s avant-garde designs in her AW14-15 collection, ‘Juncture’, examine a fascinating interplay between water and fabric. Archibald is fascinated by water and its ever-changing state, particularly its relation to movement, control and the body. The qualities of the medium itself are mimicked by the colour, light and movement of the collection with its fluid lines and unexpected contrasts. ‘Golden Dawn’ is an apt title for Isabella Lyginou’s collection, with its exploration of light and colour. Lyginou was inspired by Ancient Greece and its mythology, but not in the literal or historical way one might expect. Instead she developed her work around the concept of ‘negative space’ and shadows, which contrasts with her other source of inspiration – the bright hues and lavish aesthetic of Fabergé Eggs. Laura-Jayne Nevin’s final year collection takes its inspiration from childhood memories of summers spent on the Scottish island of Islay, its dramatic landscapes and intriguing heritage. Handcrafted cable lace and loops create a unique texture, and evidence the designer’s fascination with traditional, often labour-intensive techniques such as hand looping and appliqué. Lauren Smith’s graduate collection, ‘Anthology’ (SS14), develops the designer’s unique style of incorporating print into fabrics. Her designs cut a bold silhouette, that is both strong and feminine, such as this wonderful oversized coat shot by The Skinny magazine. 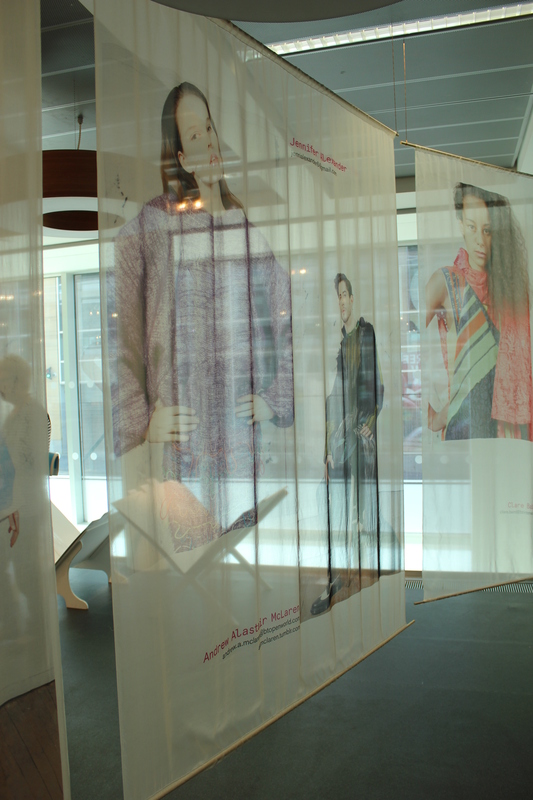 Smith was awarded the prestigious Gold award at Graduate Fashion Week. In her SS14 graduate collection, ‘Blue Rhapsody’, Morwenna Darwell has utilised unexpected and unconventional materials – such as silicone and textured plastic – in a way that is completely new and entirely wearable. Her unique materials allow Darwell to create new textures and patterns, which are married with an individual approach to shape and cut. Melissa Thwaites’ final year collection, ‘In a Moment’, juxtaposes colours, fabrics and textures. The collection was sponsored by French lace company Sophie Hallette (the company that provided lace for Kate Middleton’s wedding dress! ), and the designer combines luxurious French lace with fine knitwear. Thwaites takes contrasting materials and colours – such as orange leather and coral lace – and combines them effortlessly. Stay tuned for more on the other graduates, including textiles and illustration.